Dinner in under 15 minutes... I think this will become a fast favorite. 1. Pat the prawns dry on kitchen paper and season lightly. Beat together 30g of the butter with the ’nduja paste in a small bowl. 2. Melt the remaining butter in a frying pan until very hot and bubbling. Add the prawns and fry for 1 minute on each side. Transfer to a plate and keep warm. 3. 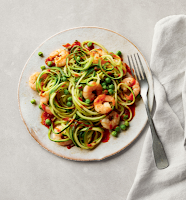 Tip the courgette spaghetti into the pan with the garlic, rosemary and peas and fry for 3-4 minutes until the courgettes are beginning to colour. 4. Tip out onto warmed serving plates and place the prawns on top. Briefly heat the ’nduja butter mixture in the pan to soften slightly and spoon over the prawns. Serve with warmed sourdough.